The Wireless LAN certified security (WLAN-CSE) training teaches how you can secure your Wireless LAN against intruders. The material presented in the WLAN-CSE course helps you to successfully implement a Wireless network in an enterprise by training the network engineers with the existing tools and processes which are required to secure a Wireless network. The participants get to know essential and advanced processes and technologies, in order to secure the data and the network in a Wireless enterprise network. The same explosive way the Wireless LANs spread and are implemented, also the need raises to secure these networks. Daily the headlines of the IT-News report the missing of this security. The security of Wireless solution are not found in one softwareprotocol or in a hardware solution, but can only be derived from Wireless network professionals who implement multiple security measures. 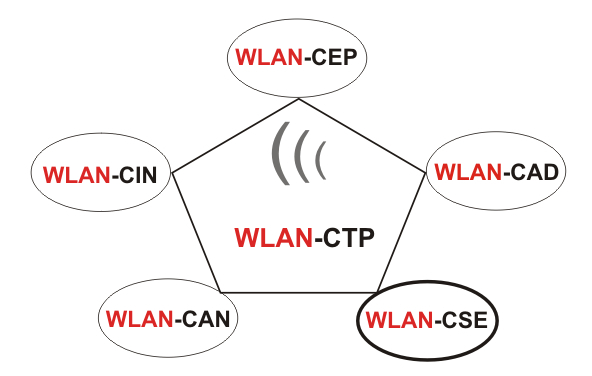 The Wireless LAN certified security (WLAN-CSE) count on the Wireless LAN know how of the WLAN-CAD certification by training of the candidates in view of security threats and vulnerability of Wireless LANs. The main topic of this training and the exams are hardware, software, protocols, procedures and design techniques which are used to reduce Wireless LAN security risks. The Wireless security certification and training is a main step in order to complete your expert know ledge concerning the Wireless technologies.